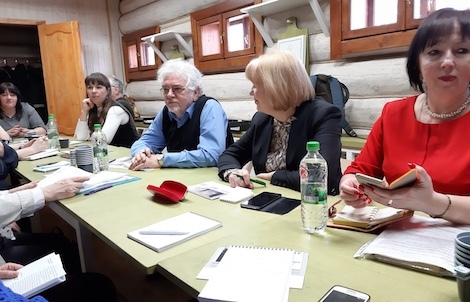 March 21, 2019: a delegation representing Taganrog Group of Museums and Taganrog Chekhov Public Library participated in the 13th international convention of Anton Chekhov museums and libraries. 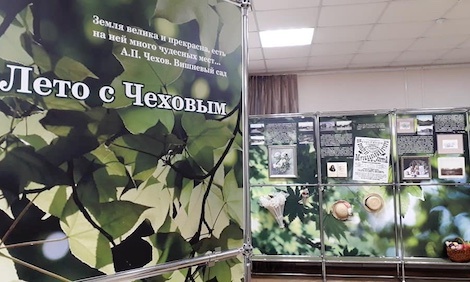 Within the framework of this convention, the traveling exhibition "The Summer in company with Chekhov" was unveiled at the Chekhov State Literary Memorial Museum-Preserve "Melikhovo" in Moscow Oblast. It was established by the staff of Taganrog Chekhov Memorial Museum-Preserve for the upcoming 160th birth anniversary of Anton Chekhov. The project was supported by the Rostov Oblast Government. The participants of the 13th international convention of Anton Chekhov museums and libraries, which included German Chekhov scholar and director of "Tschechow Salon" museum, Mr. Heinz Setzer from partner city Badenweiler, were the first visitors of "The Summer in company with Chekhov". The activities and the program of the forthcoming 160th Chekhov birth anniversary, new museum projects, new joint publication and exhibition projects were discussed at the convention. Deputy director of Taganrog Museum-Preserve Mrs. Tokmakova and director of Taganrog Literature Museum "Chekhov Gymnasium" Mrs. Vysotskaya presented to the museum community, for the first time, the exhibition plan of the new museum "Chekhov Family Seat" - Pavel Yegorovich Chekhov's house. The reconstruction works at the site near the end, and the new museum is to open its doors to the public in the new future.